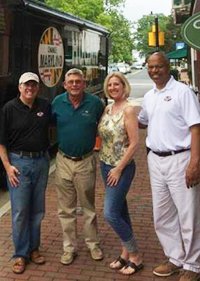 We were happy to be visited to Larry Hogan who is now our Maryland Governor. Larry Hogan is not a career politician. He is a small businessman, a concerned citizen, and a lifelong Marylander who loves this state. Hogan is the Founder, President, and CEO of The Hogan Companies, a leader in economic development for over 25 years, and has brought hundreds of businesses and thousands of jobs to Maryland. He clearly understands how government policy can have an impact on business growth and job creation. Albright’s Gun Shop is fortunate to have some well-known publications mention or write articles about the shop. Albright’s strives to keep an authentic gun shop feel and to bring quality guns and gunsmithing to the public. Maryland’s Eastern Shore is a wonderful place to hunt and fish, and historic Easton is the center of the hunting, dining and social activity.